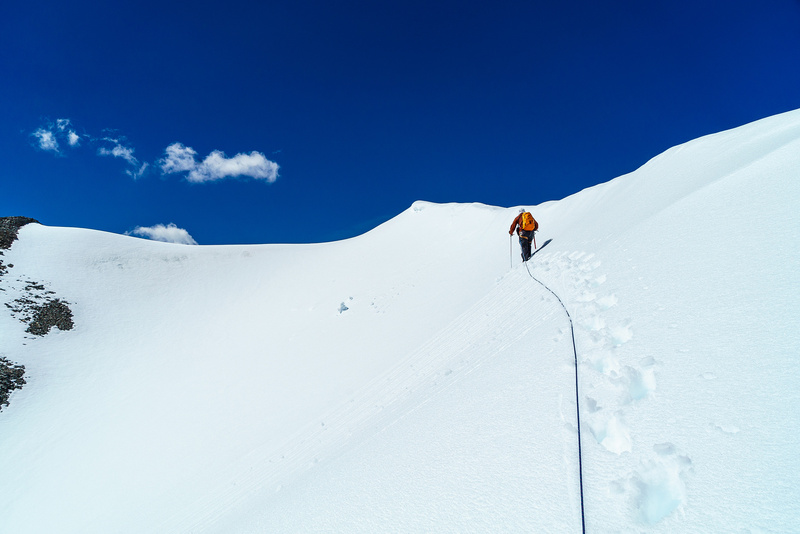 Difficulty Notes: Depending on conditions, there are either avalanche or crevasse risks. 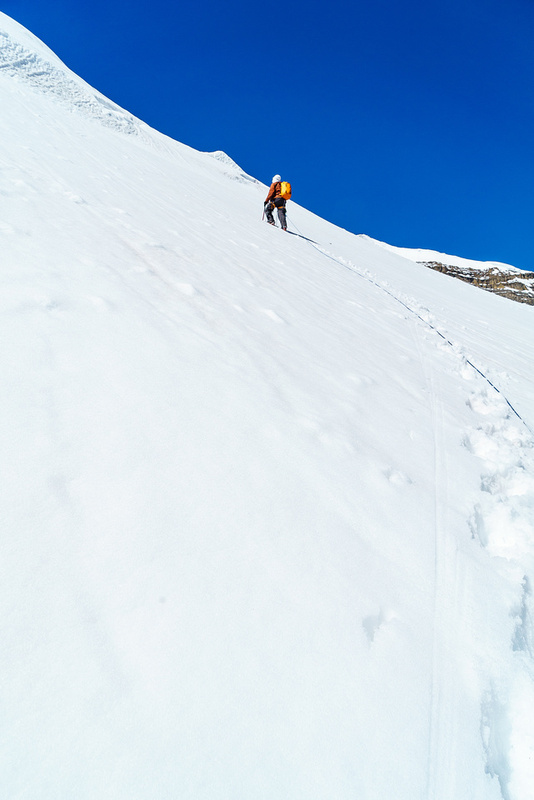 The steep slopes under the summit can also be very icy. We used some ice gear in the conditions we had. 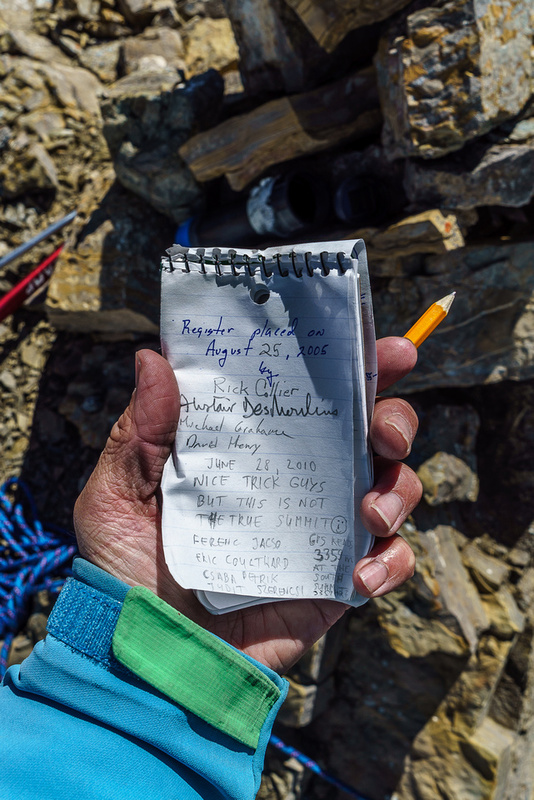 Note: Stats indicated are from a glacier bivy near Mount Brazeau. Warren is MUCH further from Swan Pass! If I’m completely honest about it, I didn’t really feel like climbing Warren after a long day of approaching and climbing Mount Brazeau the day before, not to mention a very restless night spent sleeping in a very noisy and cold mid, thanks to a strong west wind blasting our exposed bivy site on the glacier. Somehow, I’d miscalculated how chilly it was going to be at around 10,000 feet on a large icefield at the beginning of August! 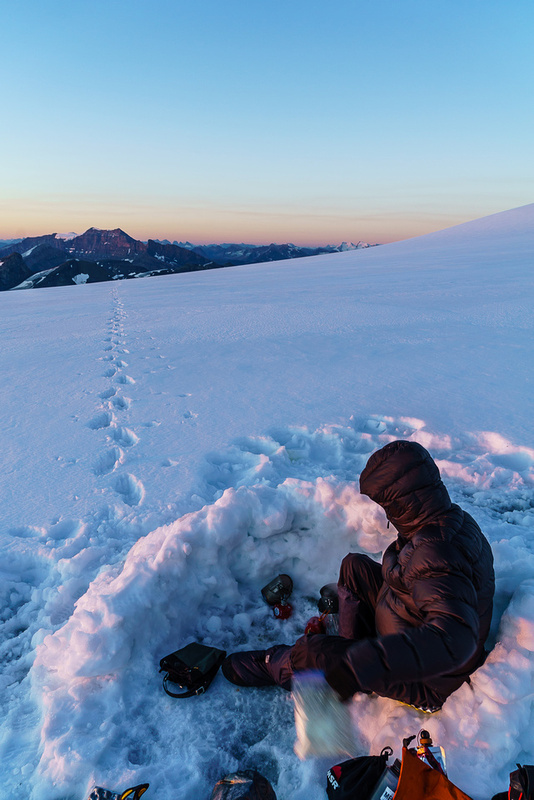 I was really wishing for my down jacket during the night and it took all we had to force ourselves out of bed at 06:30 to put on soaking wet boots and get the stoves fired up, all while feeling the bite of a cold morning wind no matter where we sat or how small we tried to make ourselves. Our route to Mount Warren from our high bivy on the Brazeau Icefield. Note how we stuck to skier’s right to access the lower glacier, rather than following the fall line right down the middle. When the sun started to shine on us out mood changed dramatically and by around 07:00 we were finally ready to tackle another day. 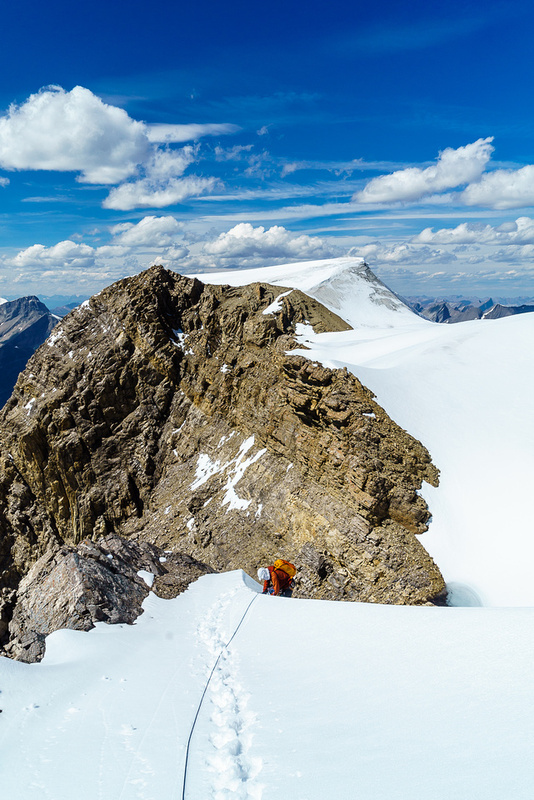 At this point we were feeling positive enough that we thought there was a decent chance that we’d even manage to bag Monkhead Mountain and move our camp to the much warmer high rock bivy corral at Swan Pass. We knew exactly where to descend the glacier thanks to the previous days scouting from Brazeau and soon we were sliding down scree next to the heavily crevassed glacier dropping down a few hundred meters to give us access to the lower Brazeau Icefield on the east and north sides of Mount Brazeau and Mount Warren. We’re warming up now that the sun is out! Named by Mary Schaffer in 1908. Warren, Billy (An early outfitter in the Rockies, Billy Warren guided Mary Schaffer to Maligne Lake in 1908.) Official name. First ascended in 1928 by W.R. Hainsworth, M.M. StrumiaJournal reference CAJ 17-25. We knew of some previous parties who have gotten into serious crevasse issues on this section. 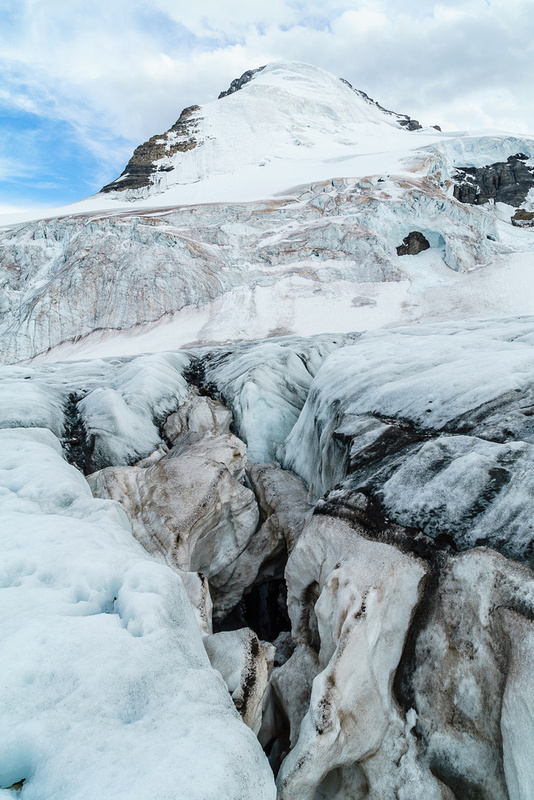 The fall line is right in the center of the icefield, but this is full of large holes and running rivers of water. In our extremely dry conditions, we wanted to avoid as many holes as possible, covered or not. 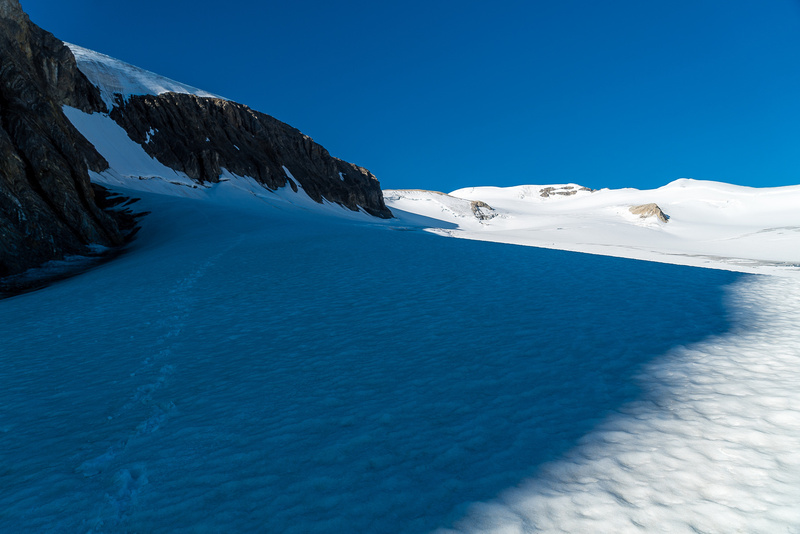 We choose to stick beneath the rocky cliffs of the ridge breaking the lower / upper icefield and thereby stay on as much snow as possible and taking a wide detour around the center part of the lower icefield on skier’s right side before sneaking across to Mount Warren. At first we stuck to the ice, but soon we detoured right and just bashed down the scree which was easier, safer and faster. Sticking to the snow covered bench worked fairly well. We crossed a few icy gullies before finally being forced to cross a fairly wide and sketchy bergschrund to get down onto the bench proper. There was no good way across the ‘schrund so we ended up doing ice ax belays and scooting over the hole on our butts while holding our breath and hoping fervently that the soft snow would hold. This wasn’t very encouraging and already at this point I was having doubts about the conditions being great for Warren. After dealing with such soft bridges the day previous already, this was starting to feel like deja vu. 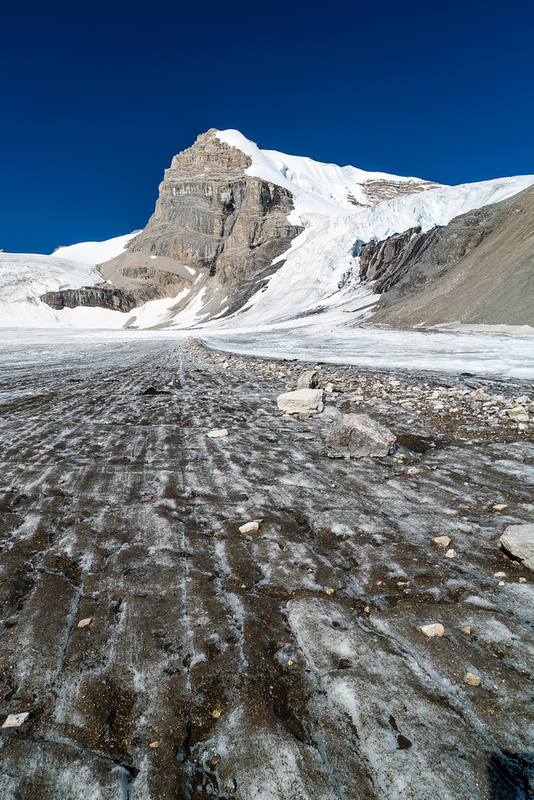 We kept going under an increasingly warm sun – the stiff west wind now blocked by the icefield and peaks above. We went a little far east and had to work our way across some problematic slots before finally reaching the rocky slope just in front of us here to the right of Ben. After reaching the bare, lower glacier, we made better time towards Mount Warren. 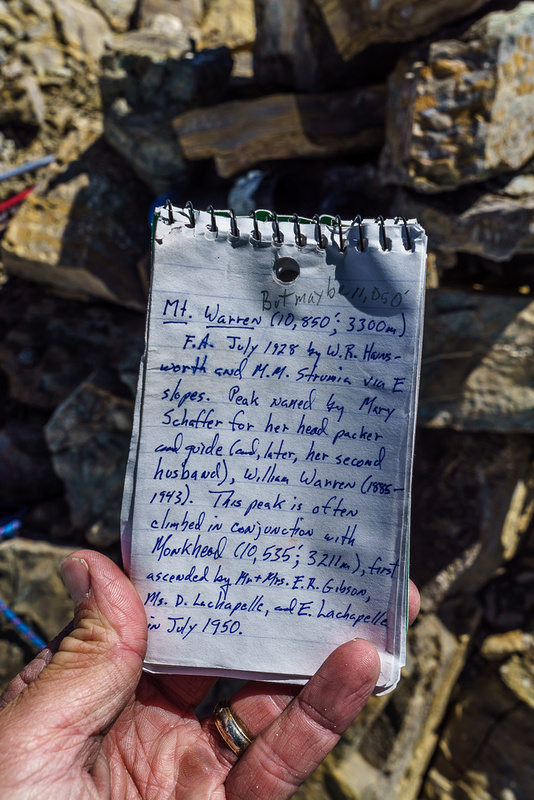 Speaking of Mount Warren – I was again wondering if maybe we were not going to make it to a summit this particular day. The sun was HOT and Warren was not looking easy in these conditions! 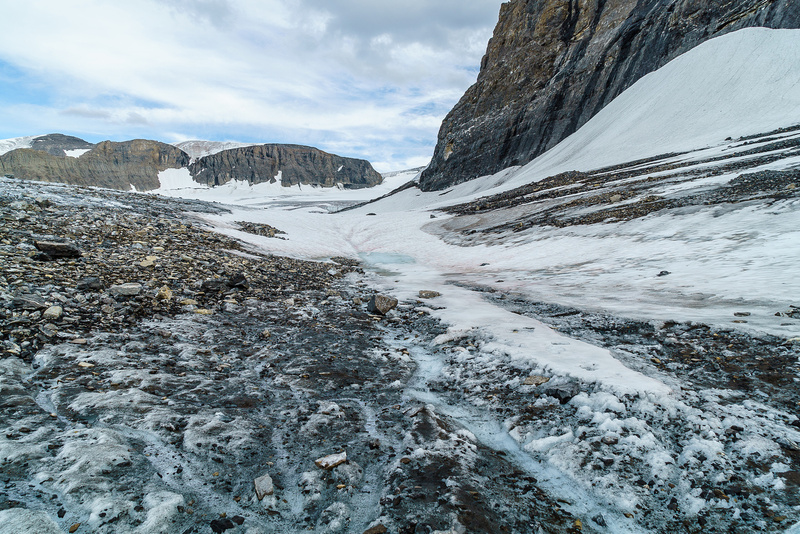 The lower glacier on it’s eastern flank looked very crevassed and it’s upper slope was looking suspiciously like dirty ice rather than the clean 35-40 degree snow line that we were hoping for – and geared for I might add! 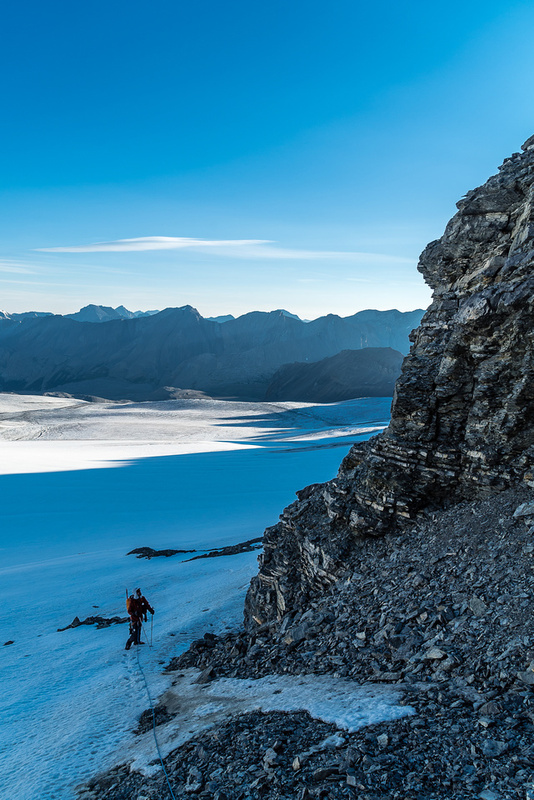 We crossed the glacier past the very impressive east face of Brazeau before contouring slightly left towards an obvious scree / rock access to Warren’s glacier above. By now we could see the incredibly dry north face of Brazeau and hear the ice fall coming off both Brazeau and Warren’s north and south faces respectively. 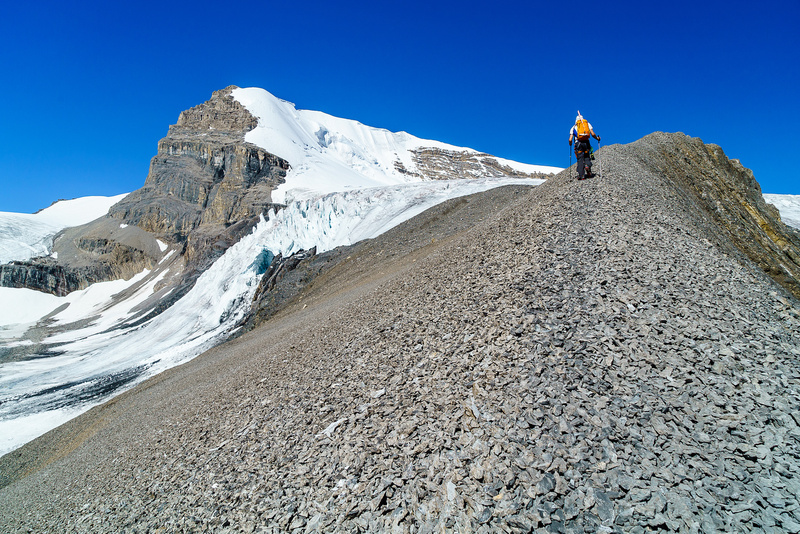 After dealing with some large and problematic crevasses just under the rock access ridge on Warren, we finally stepped of the lower Brazeau Icefield and started up on loose scree / slabs to the glacial bench on Warren. 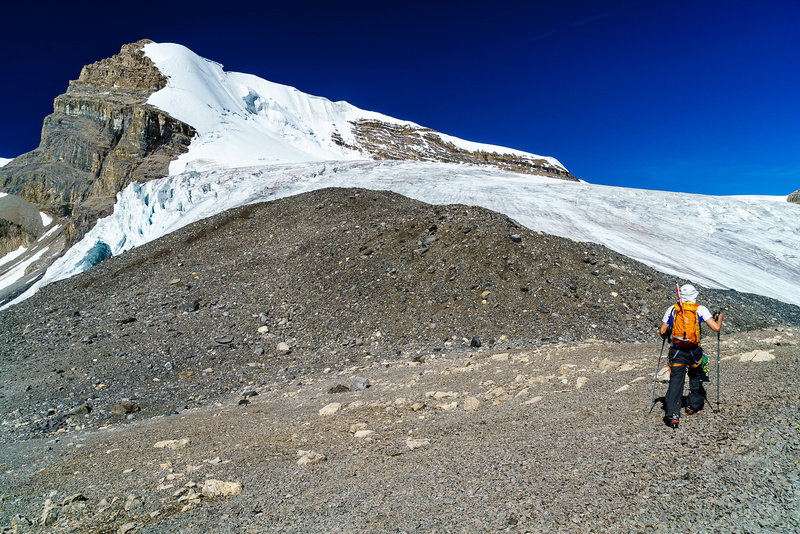 I’m not sure how Ben was feeling at this point but I was tired of dealing with crevasses and weak snow bridges and was starting to wonder about our determination to push on despite very sub-optimal conditions. The issue was that we were here now, and the weather was very nice despite everything else. So far we hadn’t felt unsafe, so it made sense to keep trying around the next corner. We followed a faint track in the scree up to a nice scree ridge walk before arriving at the upper glacial bench under the east face / ridge of Mount Warren. Ben makes his way up scree towards the glacial bench on Warren. As we gained the glacial bench beneath the east face of Mount Warren, we glanced nervously ahead at some pretty broken crevassed terrain and then our eyes wandered upwards to the east face / ridge to the large ‘schrund splitting the face and abutting the ridge. The good news was that there appeared to be some pretty decent bridging over the large ‘schrund. 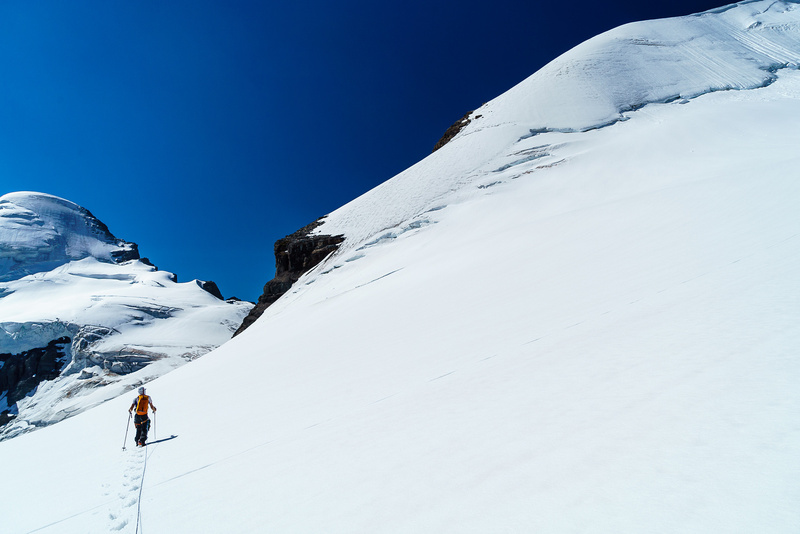 The bad news was that the upper face was looking a bit bare for snow… We turned our minds to the present task and started crossing the glacier towards the face. Soon we were faced with some tricky choices. Between some pretty big holes and bergschrunds there were large patches of snow which looked very much like bridges, or at least partly bridged. Ben probed very carefully as he started across. It was weird when we were both on the same patch of snow – I really hoped it wasn’t one huge bridge! After doing this twice and getting through the worst of it, we kept probing carefully and made our way to climber’s left of the steeper slope ahead. Ben works towards the left side of the east face, to grant us access to the east ridge as soon as possible. 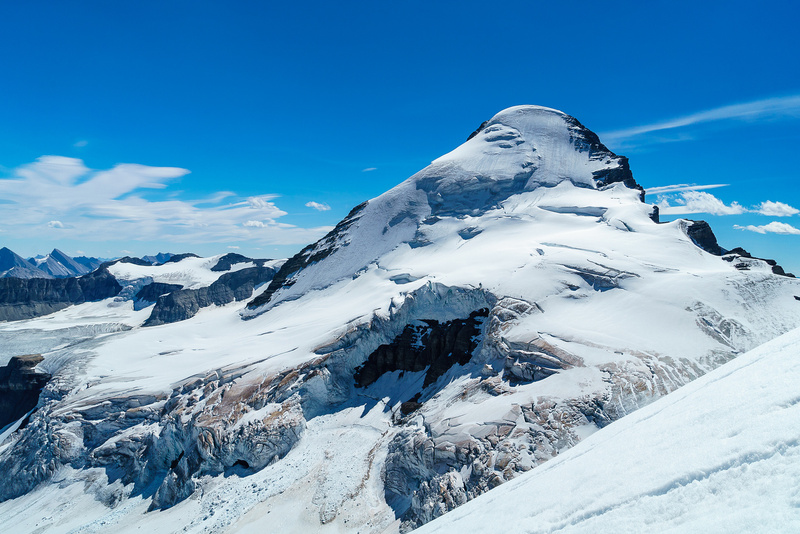 Originally we were hoping to sneak onto the east ridge via a steep (but short) slope on climber’s left of the ‘schrund, right above the icefall coming off the glacial bench. We approached this gully and Ben’s voice sounded worried as he stepped onto the gully. “Ice”, he said back to me. CRAP. Of course, you’ll remember that we left our 2nd axes behind right? And even worse, Ben didn’t bring an ice ax at all! 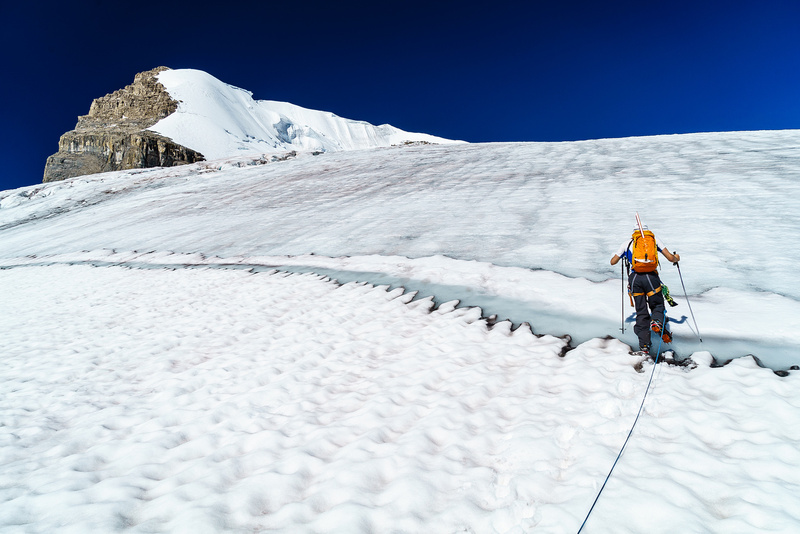 We were hoping and expecting a snow climb and certainly didn’t have the necessary gear to make us comfortable on any sort of hard, steep, glacial ice. Hmmm. What to do now? 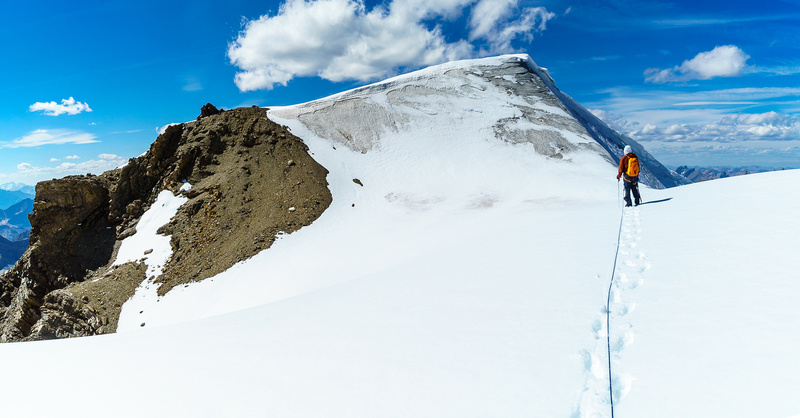 I suggested we traverse up the ‘schrund and try a snow bridge a bit higher up the east face – hopefully the gully would be snow a bit higher up. We weren’t convinced, but we tried anyway. After setting up a belay, Ben inched his way across a huge bridge and set up an ice screw on the other side to help me across. After crossing, I could see that the gully in front and above us was still ice, rather than snow. With a good ice screw belay, I continued up and across the slope to try to gain some rocks on the far side which we could hopefully scramble up to the east ridge. I put in another screw half way before getting across a pretty steep, bare section of ice and the rock. As luck would have it I ended up belaying Ben over while standing under a small waterfall – thank goodness my pack is completely waterproof! Ben made it up and over, but I could tell that his ax wasn’t ideal on ice. Ben delicately crosses a large bridge over the ‘schrund on Warren’s lower east face. After crossing the icy gully, Ben continued upwards on belay, gaining a snowy bench at the top of the rocks above me. He yelled down that he couldn’t find a decent anchor to belay me up, so I had two choices: follow his tracks off belay, or try to scramble the rocks, again without a belay. I decided to try the rocks, since we’d likely have to descend this way anyhow (with nothing good to rap off of above, we’d be forced to down climb). I managed to find a route up to Ben through very wet and chossy rock. It would be tricky to down climb, but it would probably work. Thankfully the terrain on the east ridge was snow covered, rather than ice. The only scary thing remaining with the snow-on-ice scenario was something I noticed when Ben crossed the icy gully on belay. As he transitioned to snow above me in the gully, he kicked off a large slough which simply ran off the ice below and exposed the whole slope back to pure ice again! I didn’t want this to happen on the east ridge or we’d be in for a long down climb on ice with only one ax each, or worse, we could slide off with it, over the ice fall to the lower glacier far below. The snow seemed fairly well bonded, but the stress of the situation was slowly building as we worked our way up to the next icy gully on the ridge above us. Finally on snow again! It’s slushy crap, but it’s snow at least. Our most stressful part of the climb followed the first steep snow section on the east ridge of Warren. Here we came to another icy gully with rock above, on the left. 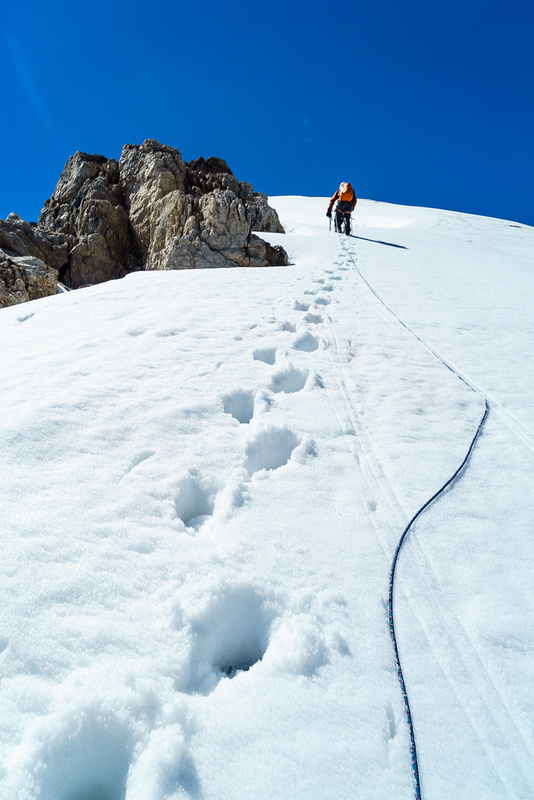 In order to reach the rock, we first had to climb some sloppy snow right next to the ice with some exposure down to our left – especially worrisome with the thin snow on ice that we were on. As Ben looked for a way to transition to the rock, a barrage of rocks came cascading down the gully – just missing us! I was done at this point. I yelled up to Ben that we were “turning back”! Ben agreed, but did point out that another few meters and we were back off ice and on “easier” rock. I pondered this for a few seconds. 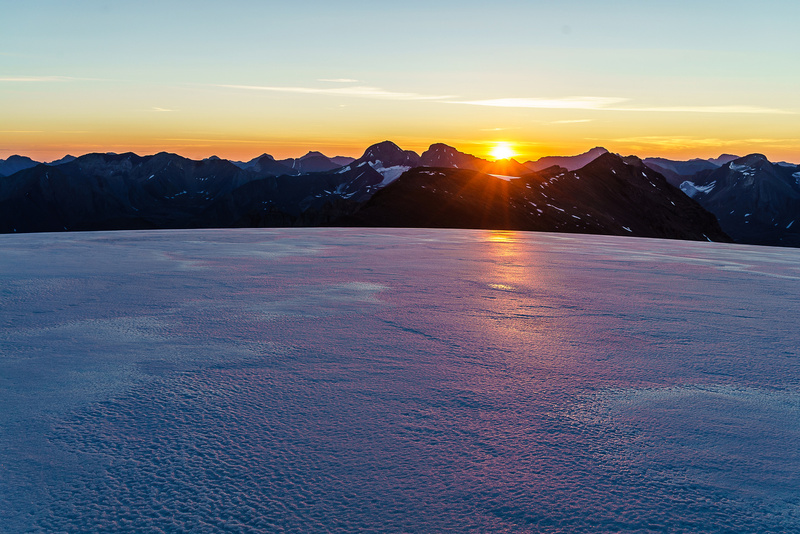 When I thought about our situation, I could see that the rocks couldn’t hit us where we were, and down climbing now might actually be worse than in a few more hours when the sun would be off the lower slopes. I decided to try another 5 minutes or so. After a few minutes we were back on rocks, which transitioned to snow and finally to gentler summit slopes. By this time the afternoon was slipping away and we were looking at another return to camp in the dark. Monkhead Mountain was not going to happen. The gorgeous north face of Mount Brazeau. Gorgeous views to the west off the summit ridge over the Coronet Creek valley. One thing I’d noticed on So Nakagawa’s trip report was his mention of a “higher point” before the summit. This was a bit confusing until we stood on that “higher point”. For some reason the official summit of Warren seems to be a slightly lower point than the high point, 300 meters to the north. 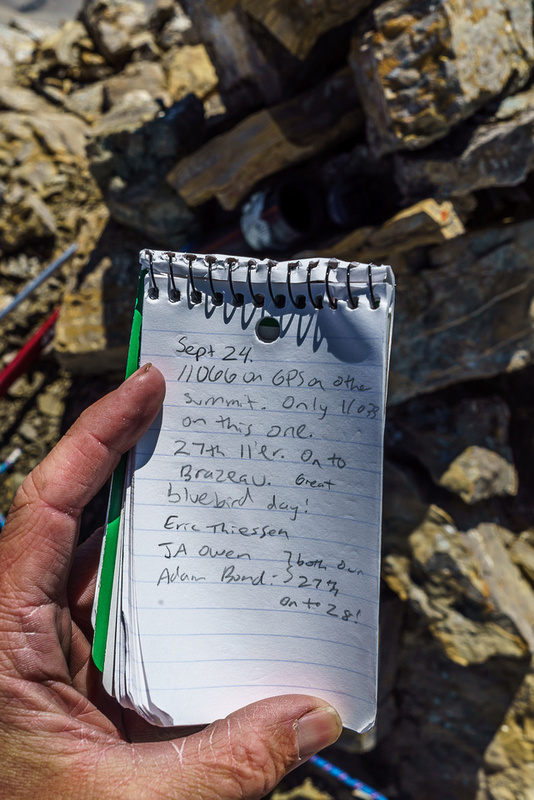 I don’t know if this is officially true or not, but we hadn’t gone through all that we did just to miss the true summit by 300 meters, so off we went, just to confirm that we did indeed tag the summit of Mount Warren! I measured the high point at 3359m. 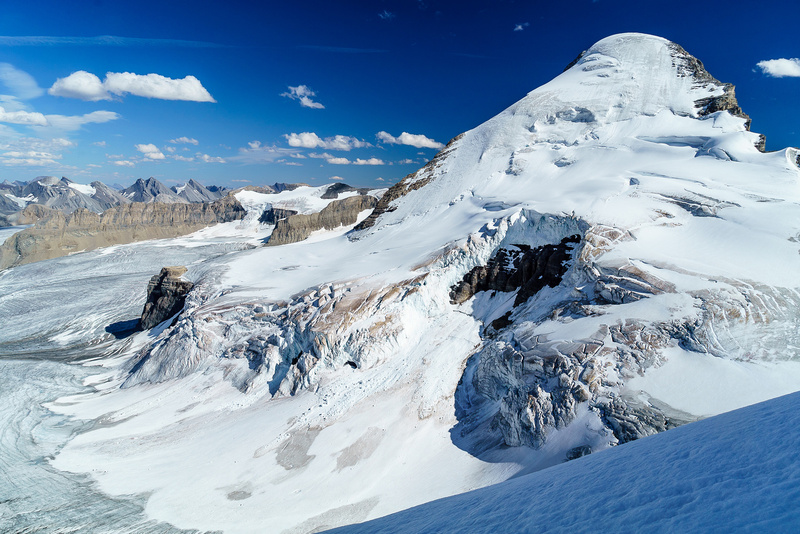 After a short, but once again undulating, traverse to the next summit, we topped out to an incredible view of Maligne Lake – one of the most surprising and amazing summit top-outs I’ve had in a long time! 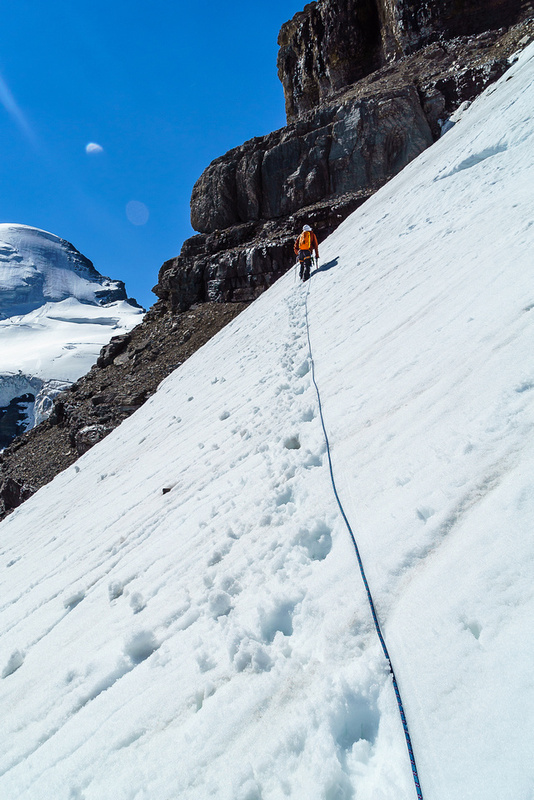 I was thankful that we made the traverse even if it measured 2 meters lower at 3357m. We took a number of photos in the clear late summer afternoon air (this in itself was incredible, considering all the haze and forest fire smoke in the area only 10 days previous), including views of Maligne Lake, Charlton and Unwin and many, many others. We even traversed to a rocky point just under the north summit which contained a Collier register with the previous entry from around 2011. Summit shot looking south from the summit of Warren towards Brazeau. This is what we fought up this peak for! 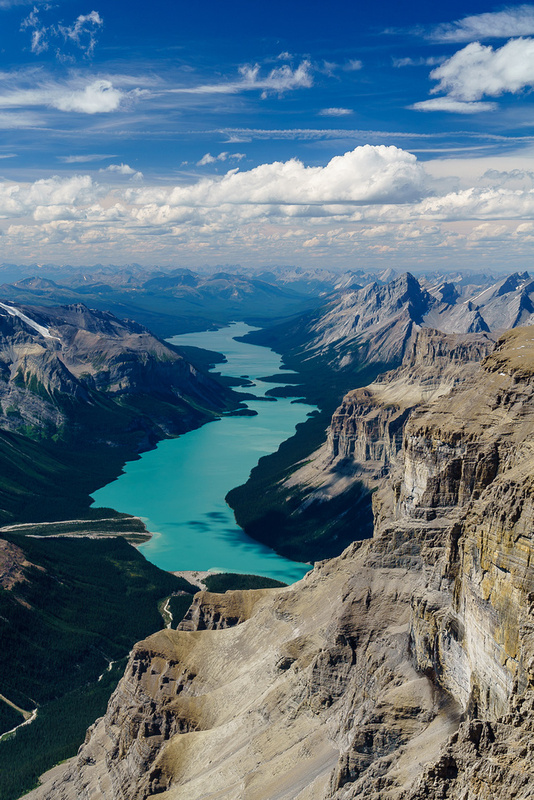 Incredible views of Monkhead Peak and Maligne Lake. Charlton and Unwin at left, Maligne Mountain at right. 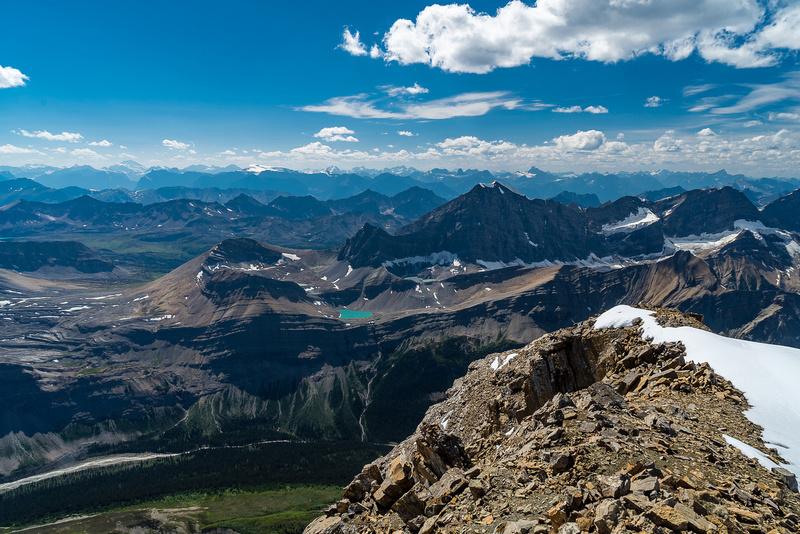 The view from the rocky summit with the register showing the north side of Brazeau and the Coronet Creek valley between Warren, Brazeau and Coronet, Mary Vaux and Julian Peak. Looking back at the summit (R) and down the ascent ridge (L) from the high point. After signing the register and taking a zillion photos, we continued back along the ridge to the high point before deciding that despite the nice weather, we’d best be moving on down. We had a long day still ahead of us, and the snow was only melting out quicker on all the ice slopes down the east ridge / face. The upper east ridge was fairly easy to descend, as long as we took our time to knock the sticky afternoon slush off our crampons! 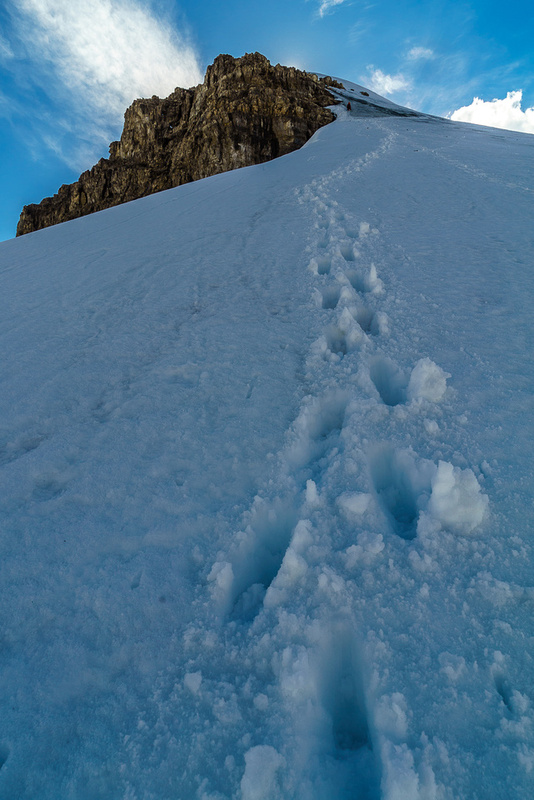 When we got to the first rock / ice gully we had some tricky down climbing to do. 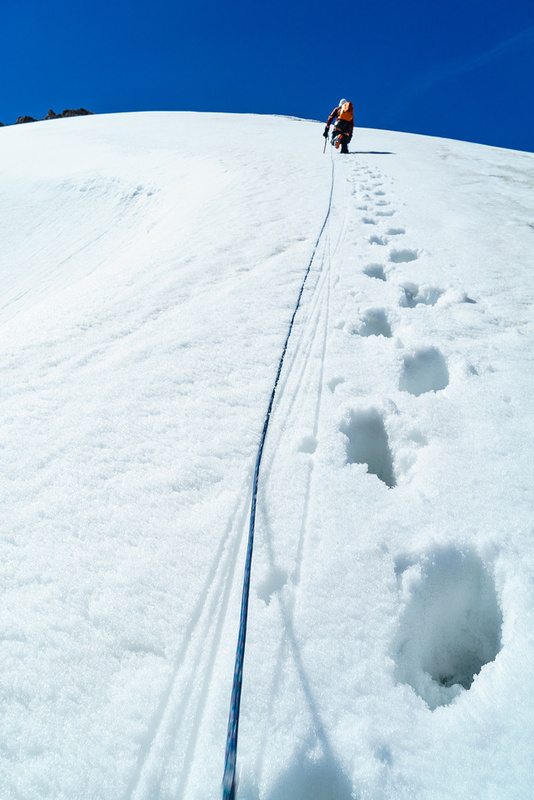 We didn’t put the rope on for this section – a choice we both agreed with in case of a slip on the steep slope. Protecting it was almost impossible and it was a relatively short down climb. We found no slots here on the ascent. After carefully down climbing the ice with one ax, we descended to the lower rock band over the first ice gully and ‘schrund. Down climbing this rock band wasn’t too bad, but certainly wouldn’t be anyone’s first choice! The rock was horribly loose, steep, exposed and covered with running water. Getting back under a familiar running waterfall (! ), I set up a screw and waited for Ben to arrive. When Ben arrived, he belayed me while I traversed the ice gully and set up another screw before down climbing to the ‘schrund. Ben followed me and we belayed each other to safety. Phew! 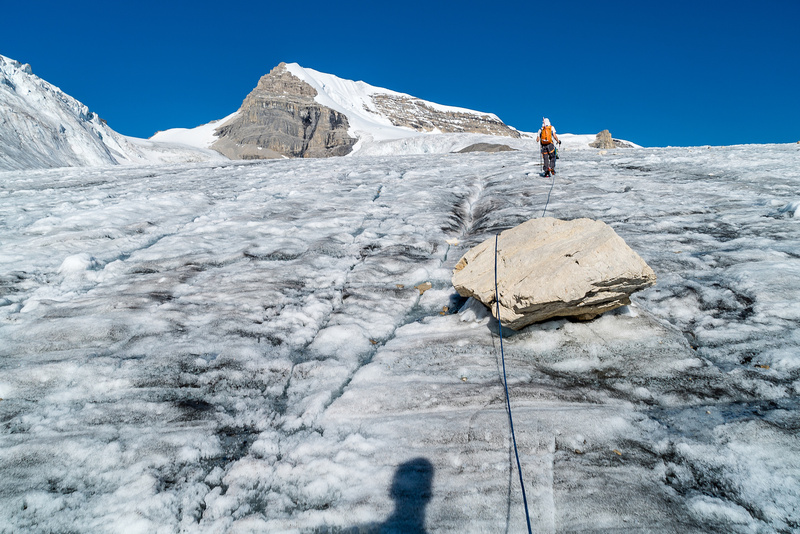 Finally we were off the worst of it, but still had hours and hours of tricky crevassed terrain to cross before arriving back at our glacier bivy. Another shot of the top of the east ridge with our dramatic views of Brazeau with our long egress route at center along the crevassed glacier. Icy, crevassed terrain under the east face / ridge of Mount Warren. We were much more nervous about crossing snow bridges on the way back to our bivy that evening. 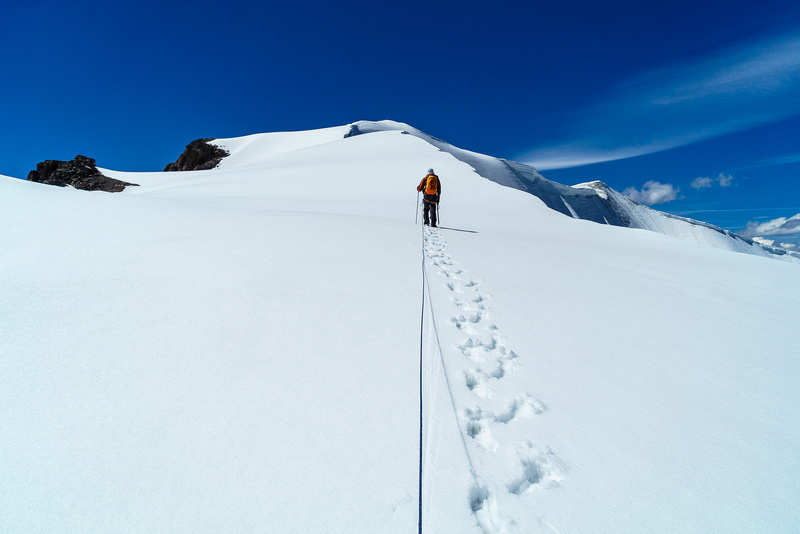 Every time we probed through a crevasse the lack of resistance in the snow made us cringe. 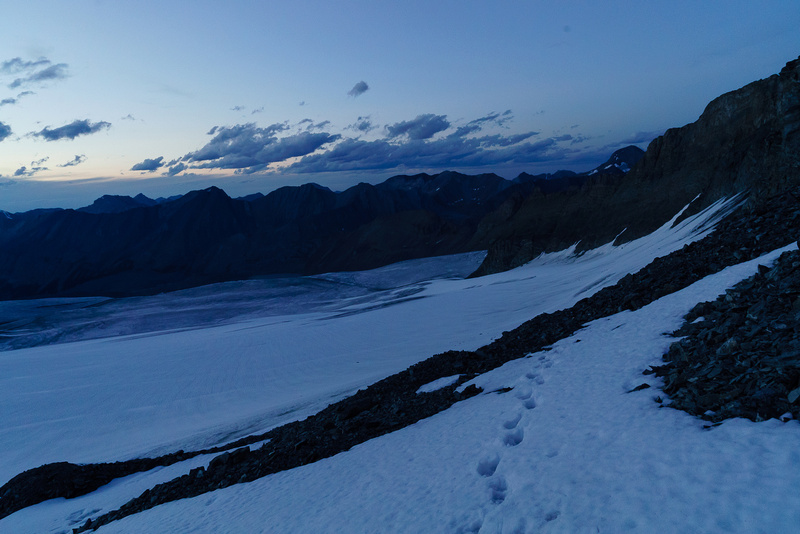 We managed to down climb the scree / slab ridge to the lower glacier before setting out across it, back to the bench leading up to our bivy. 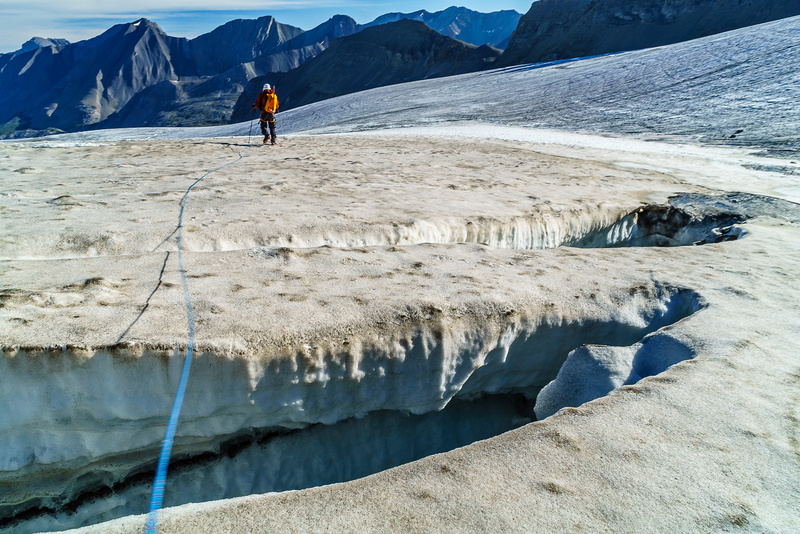 This time we made a more direct line across the glacier, passing close to Brazeau’s east face. We witnessed some BIG ice falls coming off the melting north face of Brazeau along the way. The bench was very slushy snow, but we made it up and over the ‘schrund and back to the scree we’d descended in the morning. 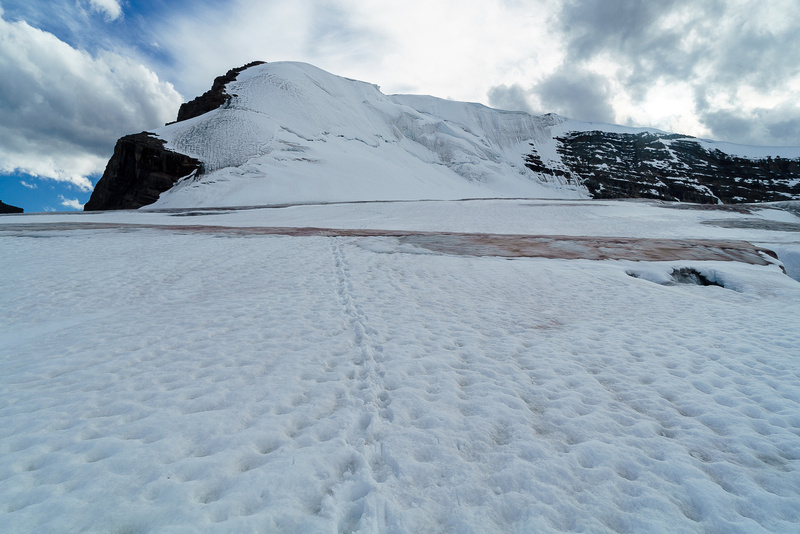 We noticed the dramatic snow melt as we traversed back to camp under a darkening sky – much more of the glacier was visible after just one hot day. Brazeau’s upper slope was almost completely melted off already! 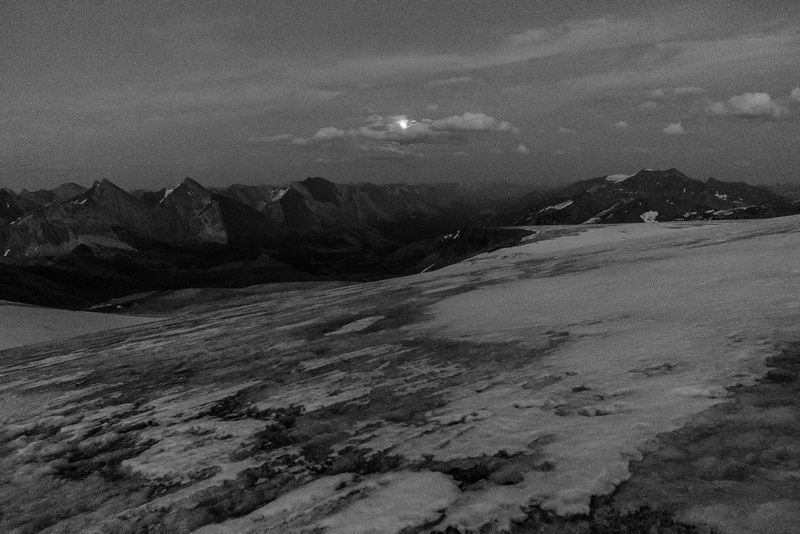 A melted out glacier and the blue moon as we trudge back to camp at 22:30 on Friday night. We arrived at camp at around 22:30 and took the time to cook a good warm supper. We agreed that we’d wait for the sun to rise the next morning before getting up. We planned on going up Henry MacLeod before exiting to the high rock bivy and a relaxing afternoon / evening off the stressful glacier. We're warming up now that the sun is out! Approaching the descent to the lower glacier. The gravel was typical loose glacier till, but it was quick to descend. Trying not fall in a 'schrund. Looking back at our tracks along the bench - you can see the 'schrund that we eventually had to cross. Immediately upon bailing the bench we had to deal with some huge, open crevasses. Thankfully these were easy to avoid. 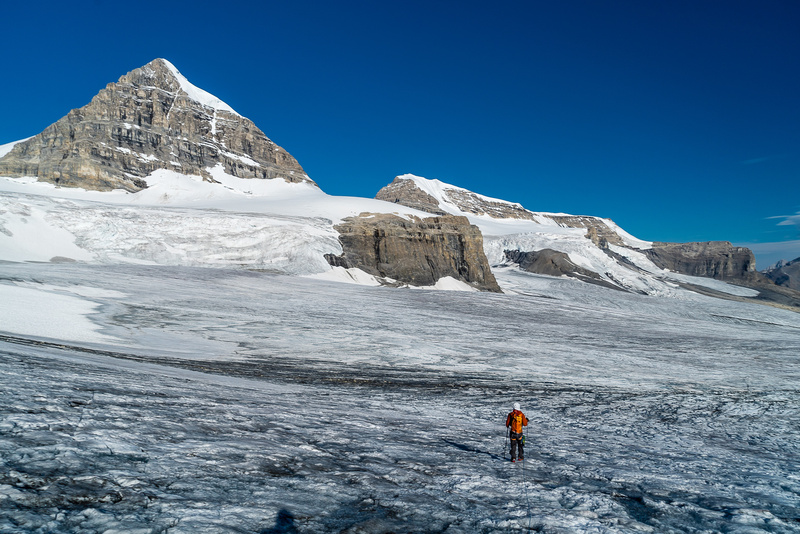 Warren finally comes into view as we start crossing the lower Brazeau Icefield towards it. The glacier was quite beautiful when we weren't cursing all the holes! I'm blown away every time I set foot on glaciers and spot 'rivers' of debris like this. Near the top of the scree access to the glacial bench with Mount Warren looming above us. Ben starts up the glacial bench. 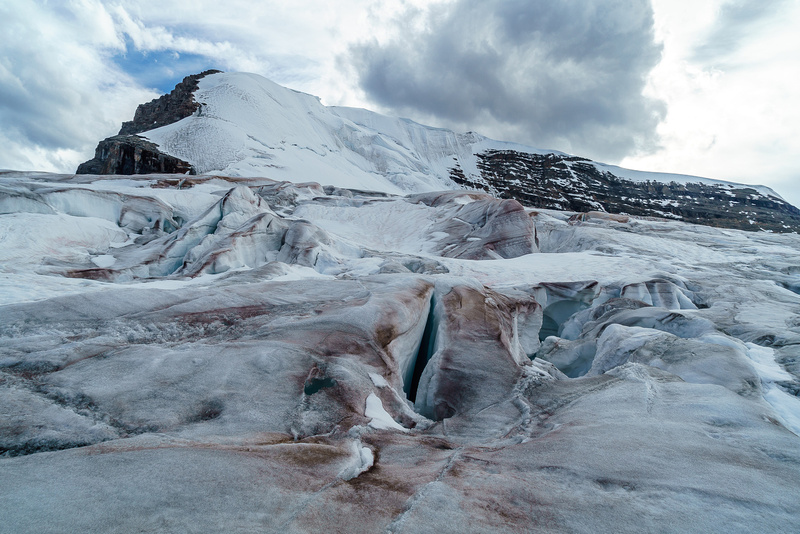 Gorgeous views of the north face of Mount Brazeau - looking very fierce in these dry, icy conditions. Looking for a way up the gully first. Ben climbs up to the schrund after we realized the gully was icy rather than snowy. Ben delicately crosses a large bridge over the 'schrund on Warren's east face. Ben approaches the rock - much steeper than it appears on the photo. There's hard ice just under the surface. Finally on snow again! It's slushy crap, but it's snow at least. Views back from where we finally topped out on the summit ridge looking at Brazeau and Coronet. Finally off the stressful east ridge and traversing snow to the summit. The upper ridge is undulating - just like the whole route so far! Ben descends off the high point towards the icy summit in the bg. Gorgeous views to the west off the summit ridge. Ben under the summit of Mount Warren. We found crevasses even on this summit slope! 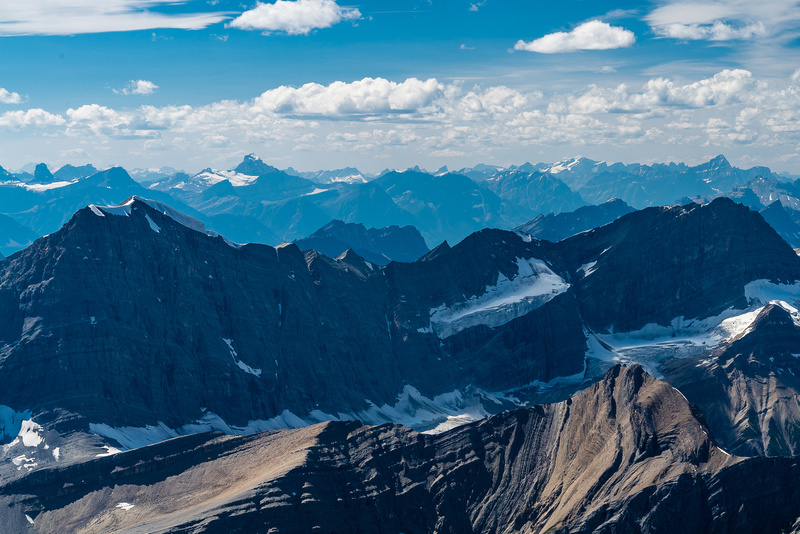 Looking over Monkhead to Maligne Lake and other peaks to the north. This is what we fought up this peak for! 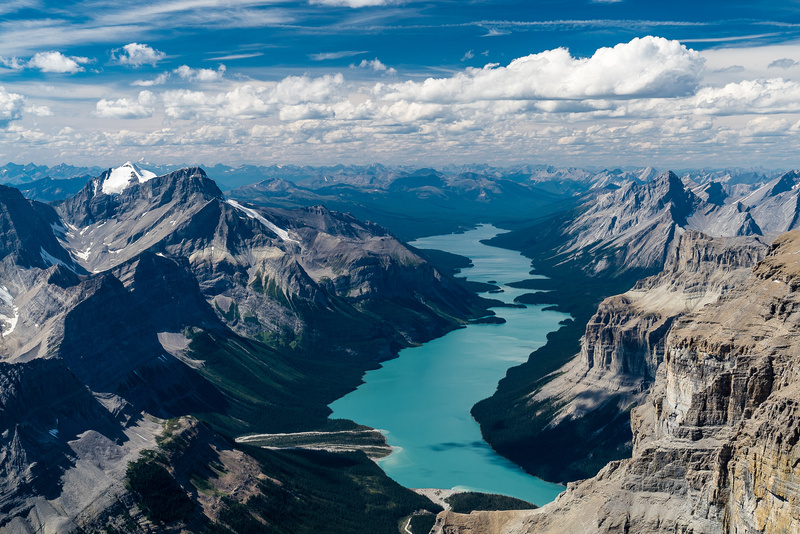 Incredible views of Monkhead Peak and Maligne Lake. Maligne Lake with the Coronet Creek drainage visible. Looking over the south shoulder of Monkhead towards Maligne Mountain. Looking down Maligne Lake with Charlton and Unwin on the left. Charlton and Unwin with Edith Cavell in the far distance and even Robson showing up just over Unwin. 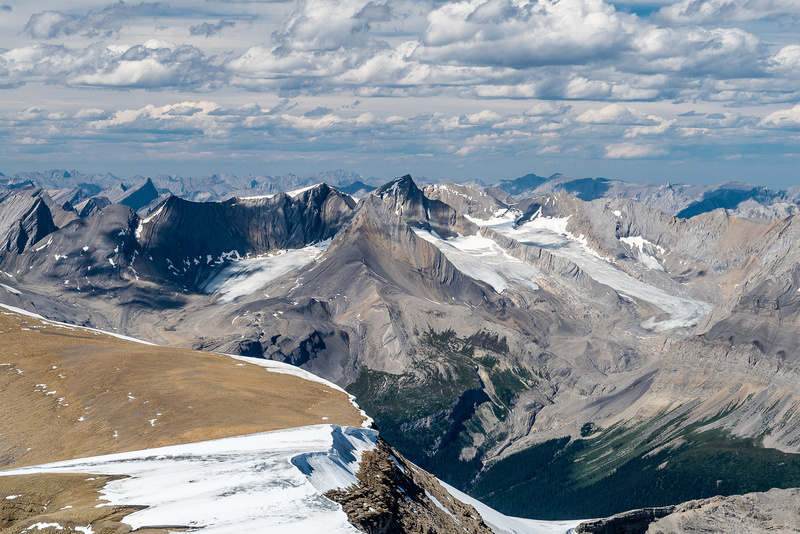 Mount Fryatt at left and Edith Cavell at right in the far distance. Mary Vaux and Llysfran at fg. 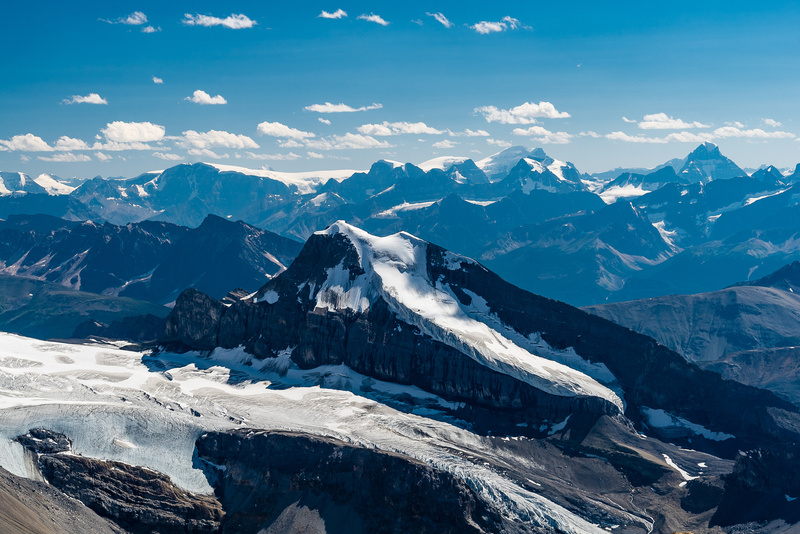 Looking over Coronet Mountain towards the north end of the Columbia Icefield with Kitchener, the Stuts, North Twin, Twins Tower, Alberta. 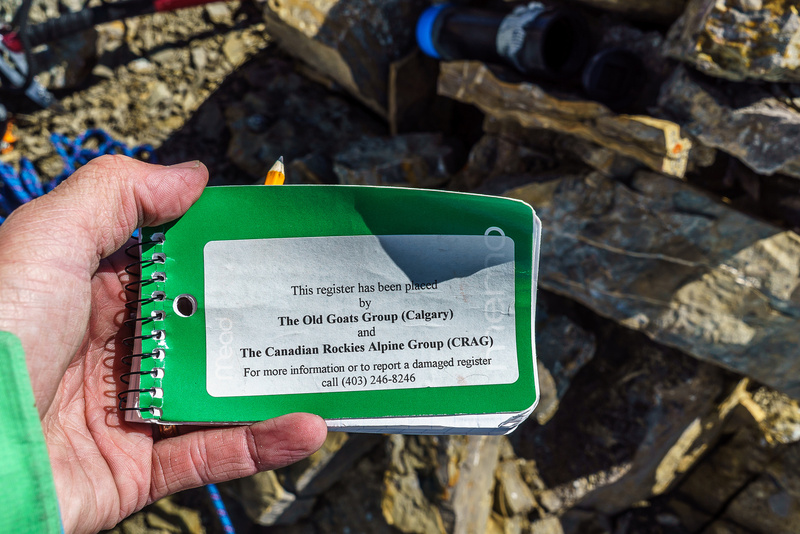 An original Old Goats summit register. 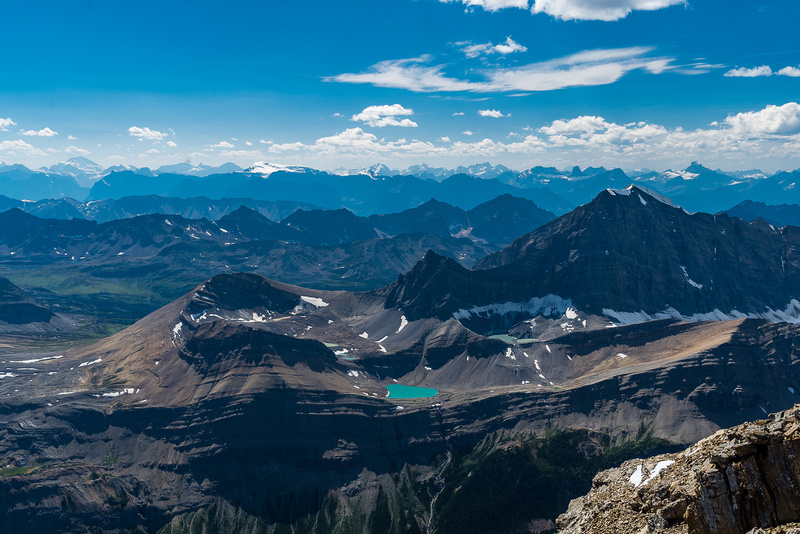 The view from the rocky summit with the register showing the north side of Brazeau and the valley between Warren, Brazeau and Coronet, Mary Vaux and Julian Peak. A lovely tarn across the valley with Mount Mary Vaux rising beyond. 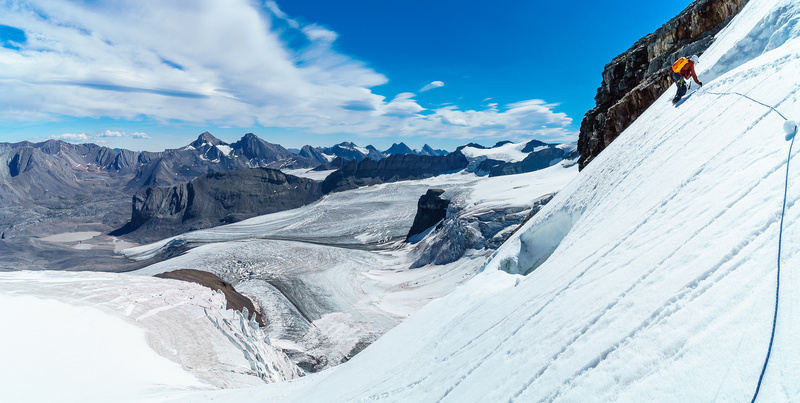 Believe it or not, Reiner Thoni made a one day ascent of Brazeau in April 2014 via snow bikes and skis down Maligne Lake! Heading back to the high point with the rocky summit at upper right with the register in it. Ben traverses a snow slope down to the face. Looking back at the summit and down the ridge from the high point. 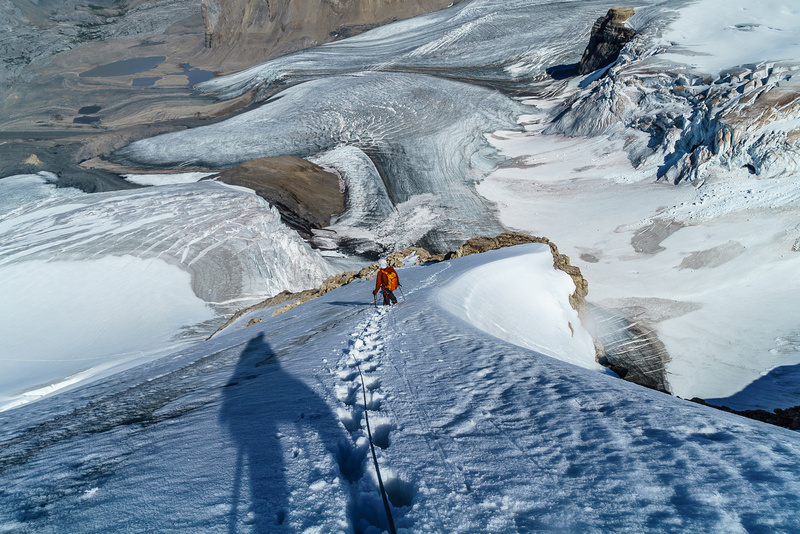 Ben descends the beautiful upper summit ridge on Mount Warren with the north face of Mount Brazeau rising dramatically in front. Ben plunge-steps the east ridge of Warren, you can see the ice just off to our right here and the rocks we utilized to avoid it below. Another shot of the east ridge with our dramatic views of Brazeau. The north face of Mount Brazeau. Looking up at Ben carefully descending the first icy gully as I keep down climbing the slurpee snow. Looking back at the very bare looking face - not much snow remaining now! We went up the left hand side. Brazeau with our ascent line on Warren at far right. 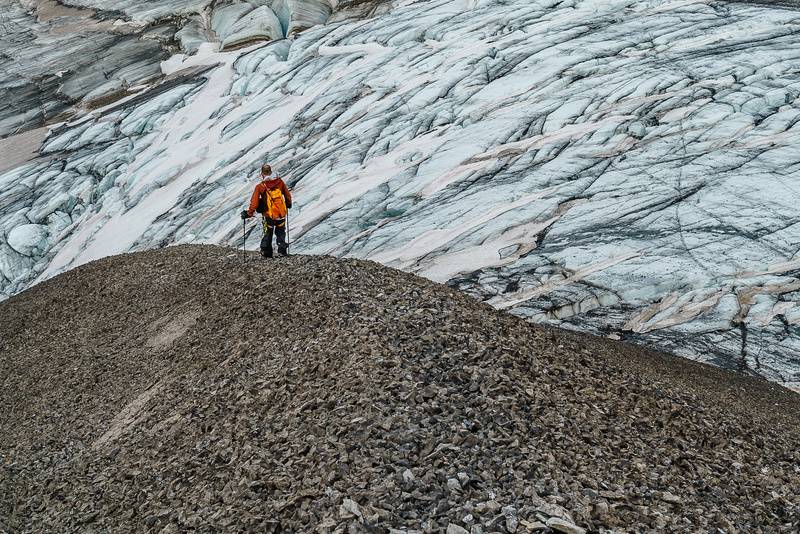 Ben descends the scree ridge to the main lower glacier, which has melted out considerably this day already. A large hole beneath the north face of Brazeau. Heading back under Brazeau (R). Crossing the large glacier to the far rock wall which we followed up to the right. Back on the bench as evening settles in, Brazeau rising on the left and the rock wall on the right. Looking back at our tracks going back up to our bivy.